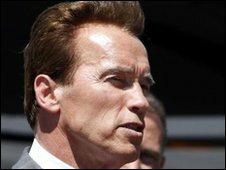 California's Governor Arnold Schwarzenegger has withdrawn his support for a plan to expand oil exploration off the state's coast. He said the spill in the Gulf of Mexico had changed his mind about the safety of oil platforms in the Pacific Ocean. Last year he pushed for more oil drilling off California's coastline. But he said after seeing television pictures of the Gulf of Mexico spill he asked himself: "Why would we want to take that kind of risk?" The state already knows the dangers of offshore drilling. In 1969 a leak from an undersea well just six miles (9.6km) off the coast of Santa Barbara coated pristine beaches with oil and killed thousands of animals. It led to a ban on new offshore development and helped galvanise the state's environmental lobby into the powerful voice it is today. Governor Schwarzenegger - who has championed the green economy and environmental protection - angered many when he proposed new exploration as a way to raise $100m (£65.6m) towards the huge state budget deficit. Now he says he would rather find another way to make up the money. California was not part of President Barack Obama's recent proposal to increase offshore exploration. And Governor Schwarzenegger's change of heart almost ensures no new drilling will be allowed in the state's waters. Which way forward for BP?